On Thursday night, Ontario’s PCs ended 15 years of Liberal power in the province, riding a wave of popular resentment against Kathleen Wynne. But what did they promise, and how do they intend to pay for it? 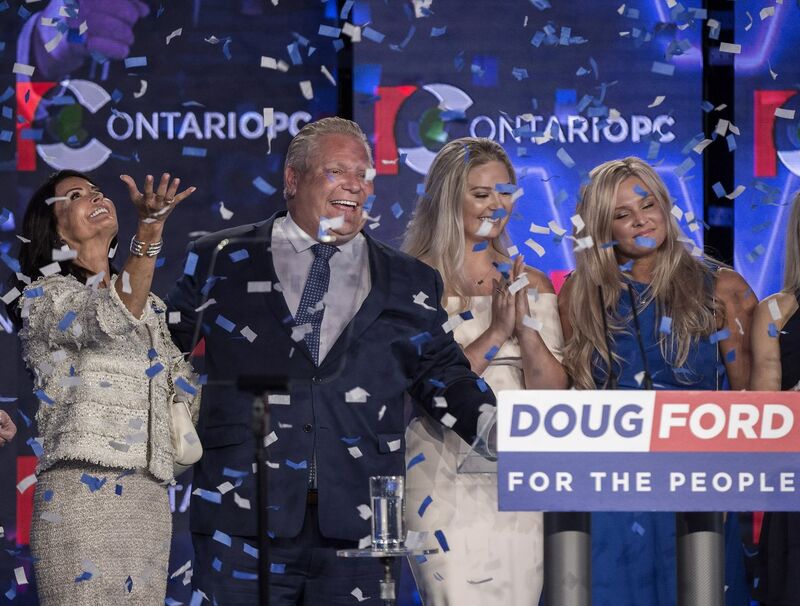 June 7, 2018: PC Leader Doug Ford reacts with his family after winning the Ontario provincial election. Doug Ford named his transition team and chief of staff Friday after his Progressive Conservatives won a comfortable majority in Ontario's election – and the province’s businesses are watching closely to find out what that will mean. The governing Liberals were decimated, losing official party status and dropping to seven seats, mostly in Toronto and Ottawa. Leader Kathleen Wynne, who conceded days earlier, announced her resignation Thursday after five years in the premier's office and 15 years of Liberal power in Ontario. The NDP's Andrea Horwath, now the Official Opposition leader, called the election a historic moment as organizers celebrated a doubling of the party’s seat count. "Today millions of people voted for change for the better," Ms. Horwath said. Green Party Leader Mike Schreiner won a former Liberal riding in Guelph, making him the provincial party's first-ever MPP. Ms. Wynne's defeat has cost Prime Minister Justin Trudeau a key Liberal ally in Ontario ahead of a federal election next year. Mr. Trudeau congratulated Mr. Ford on Thursday night, and thanked Ms. Wynne for her years of service. The Progressive Conservatives haven’t had a majority government since 2003, when premier Ernie Eves – the heir to Mike Harris’s Common Sense Revolution in the 1990s – lost to Kathleen Wynne’s predecessor, Liberal Dalton McGuinty. Doug Ford’s majority isn’t quite as big as those of PC leaders past, but it is decisive: 76 seats, up from 28 in the last election and 27 at dissolution. What made the Tory victory possible was a total collapse of the Liberals, whose leader faced record low approval ratings before the election. Liberal seats in the Toronto area were all but wiped out, with Mississauga and the 905 region going to the PCs. In all, the Liberals kept only seven seats, mostly in Toronto and Ottawa. Andrea Horwath’s New Democratic Party made gains in Southwestern Ontario’s urban ridings, but while they increased by 22 seats, it wasn’t enough to stop the PCs from reaching majority. The election also saw a higher voter turnout: About 58 per cent, compared with 51.3 per cent in 2014. What will Doug Ford do now? Watch: In his victory speech, Doug Ford said that the province was open for business. He also invoked his late brother, Rob, in thanking his family for their support. Is Ford the premier yet? Who’s going to Queen’s Park with him? On Friday morning, Mr. Ford announced campaign adviser Dean French has been asked to stay on as chief of staff. Mr. Ford also named a transition team, chaired by lawyer and political adviser Chris Froggatt and including former Conservative MP John Baird. Going into the election, Mr. Ford gave voters a long list of things a PC government would do, but very little information on how it would pay for them. The PCs didn’t release an official list of promises until May 30, which promised a complete tax cut for minimum-wage earners, gas-price cuts and lower hydro rates. What the document didn’t include was fully costed estimates of where it would find the money through taxes or efficiencies. The PCs’ list of promises, titled For the People: A Plan for Ontario, says a PC government’s first act would be to “end the Liberal practice of making millionaires from your hydro bills.” Mr. Ford has said he would fire Hydro One’s CEO Mayo Schmidt, which he does not have the authority to do, and cut hydro rates by returning Hydro One dividend payments to taxpayers and changing accounting practices for conservation programs. Both measures would cost about $800-million annually, but Mr. Ford has offered no clear explanation of how he would pay for this. Doug Ford enters Queen’s Park in the shadow of two men: His late father Doug Ford Sr., a one-term Tory MPP who brought his namesake into the family label-making business; and his late brother Rob, who served for four tumultuous years as mayor of Toronto, with Doug Ford Jr. at his side as a city councillor. Rob Ford, left, laughs with his brother Doug in 2013. At right, their father, Doug Ford Sr.
Twice now, Doug Ford Jr. has aimed for high political office using the “Ford Nation” brand of populism he and Rob Ford built at City Hall. First, he ran unsuccessfully for mayor of Toronto in 2014 after his brother, battling cancer, withdrew from the race. Then, when Progressive Conservative leader Patrick Brown was ousted over sexual misconduct allegations earlier this year, Mr. Ford ran for and won the party leadership. Hoping to become Ontario’s next premier, he stoked popular anger against Ms. Wynne’s Liberals, promising retribution against alleged government mismanagement. He succeeded, and is now headed for the province’s top job. For more background on Mr. Ford’s journey to this point, here’s some essential reading. For deeper historical perspective on the Ford years, you have plenty of books to choose from. There’s Doug Ford’s memoir from 2016, Ford Nation: Two Brothers One Vision: The True Story of the People’s Mayor. But during and shortly after Rob Ford’s mayoralty, there were more critical histories written by journalists, politicians and political aides involved in those events. What will the NDP do now? Watch: NDP Leader Andrea Horwath told a large crowd of supporters that, in its role as opposition, her party will fight for "change for the better." The Ontario NDP has been in government only once before, when Bob Rae defeated premier David Peterson’s Liberals in 1990. It isn’t a precedent Ms. Horwath embraces: Mr. Rae, faced with massive government debt, imposed unpopular austerity measures, including 1993′s infamous “Rae Days” of mandatory unpaid leave for civil servants. “This is not 1990 and I’m certainly not Bob Rae,” Ms. Horwath said at one point during the campaign, as Mr. Ford and the PCs raised the spectre of Mr. Rae to paint the NDP as dangerous. Since Mr. Rae’s time, the NDP have been accustomed to running in third place. But now they’re No. 2, with 32.2 per cent of legislature seats, compared with 19.6 per cent after the 2014 election. As the Official Opposition, Ms. Horwath’s party has a greater profile in Queen’s Park, including seats on committees. Thanks to measures introduced by the Liberals last year, the increase in popular support will mean an increase in subsidies to the party. The new Andrea Horwath: Who is she, and why are Ontarians listening to her now? What will the Liberals do now? Watch: Liberal Leader Kathleen Wynne resigns, telling supporters she had worked for all Ontarians during her career in public life. The Liberals’ loss should come as no surprise to Ms. Wynne, who publicly predicted on June 2 that her days as premier were numbered. “After Thursday, I will no longer be Ontario’s Premier. And I’m okay with that,” she said in a tearful address, where she urged voters to reject the PCs and NDP – which she deemed “too extreme” for Ontario – by electing as many Liberals as possible. The strategy didn’t work. After election day, the party has seven seats, or 5.6 per cent of the legislature, compared with the 54 per cent they won in the 2014 election. That’s the fourth largest drop ever suffered by a governing party in the province, and the second biggest loss in the Ontario Liberals’ history. The Liberals’ No. 1 loser, Harry Nixon, is worth a mention because of what happened after his election defeat in 1943: The Liberals took decades to fully regroup, and the Progressive Conservatives stayed in power for 42 years. 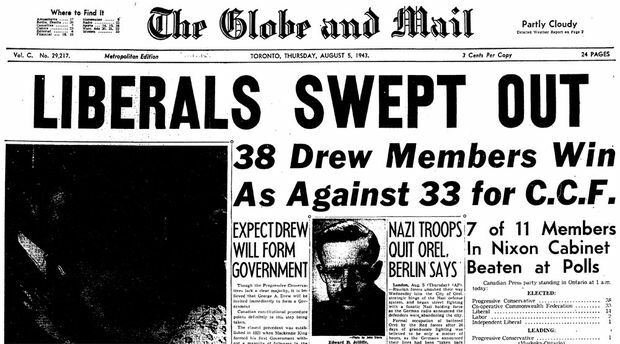 The Globe and Mail's front page from Aug. 5, 1943, after the Liberals were routed in a provincial election. Nixon, who governed for only a few months, had been dealt a much worse hand than Ms. Wynne: In the early 1940s, the Ontario Liberals were feuding among themselves, and with their federal counterparts, after premier Mitchell Hepburn picked a fight with prime minister Mackenzie King over war policy. In the political battle between Hepburn and King, Hepburn lost, resigning as premier in 1942. George Drew’s PCs were able to exploit the Liberals’ weakness at election time, but only up to a point: They won a minority, while the Co-operative Commonwealth Federation, socialist precursor to the modern NDP, rose from one seat in the legislature to 34, forming the Official Opposition. With one seat less than the number required for official party status, Ms. Wynne’s Liberals are no longer eligible for extra provincial funding, making it harder for her successor to organize a comeback. What will the Greens do now? 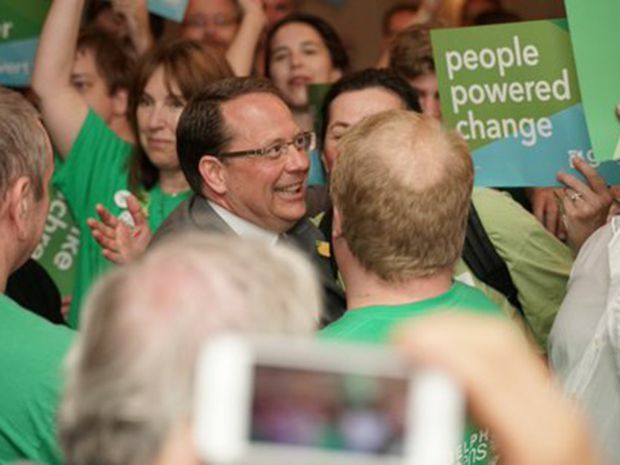 Mike Schreiner becomes the first Green MPP ever elected into the provincial legislature. If you look closely in Southwestern Ontario’s sea of Tory blue and islands of NDP orange, you’ll see a little atoll of green. In Guelph, Mike Schreiner, leader of the provincial Greens since 2009, won the party’s first-ever legislature seat. Without official party status, Mr. Schreiner won’t have much of a say in legislation and committees at Queen’s Park, but on Thursday he was hopeful that more Greens would follow in his footsteps, as they have in B.C. and PEI. “If we look at the success of Green parties in other provinces, it always starts with one leader being elected,” he said. Mr. Schreiner won kudos from the federal Green Party and his B.C. counterpart, Andrew Weaver, who helped bring that province’s NDP government to power in a close election last year. What will Ontario’s mayors do now? Oct. 23, 2014: Mayoral candidates Doug Ford and John Tory appear at the final televised mayoral debate. Mr. Tory won the election. Mr. Ford, whose bare-knuckled approach to municipal politics made him many enemies in his home city of Toronto, now goes to Queen’s Park with a radical vision of how Ontario’s cities should be run. In his 2016 memoir, he wrote that if he ever reached provincial politics, he would give mayors broader executive powers like the ones he and his brother sought in Toronto: “One person in charge, with veto power, similar to the strong mayoral systems in New York and Chicago and L.A.” He didn’t address those beliefs on the campaign trail, but he did promise a provincial takeover of Toronto’s subway network. That would bring him into a possible confrontation with Mayor John Tory, who defeated Mr. Ford in the city’s 2014 election. Mr. Tory, in congratulating Mr. Ford Thursday night, said he looked forward to working with the new premier on transit and other issues. Ottawa Mayor Jim Watson, a former Liberal MPP, also said he hoped for a productive relationship with Mr. Ford as the city gets ready to break ground on a new light-rail project. Fact check: How does Doug Ford rhetoric about his municipal career match with reality? Fact check: Doug Ford wants to take over Toronto’s subways. Would that work? What will the federal parties do now? Since Prime Minister Justin Trudeau took office in 2015, Ms. Wynne has been a major political ally. Her defeat could leave Mr. Trudeau’s Liberals at a disadvantage in next year’s election. In the meantime, Mr. Ford will likely be a thorn in Ottawa’s side on the issue of climate change: Mr. Ford opposes both carbon taxation and cap-and-trade, but under Mr. Trudeau’s climate framework, provinces who don’t adopt one of those measures will have a national carbon price imposed on them. What will the economy do now? The Ontario economy Mr. Ford inherits is relatively prosperous, but unevenly so: Toronto, Ottawa and Kitchener-Waterloo are growing cities and magnets for wealth, but in parts of Southwestern Ontario, job growth is declining or stagnant. Across the border, U.S. President Donald Trump’s recently imposed steel and aluminum tariffs – salvos in an escalating trade war with Canada – threaten to destabilize Ontario’s economy. Navigating those obstacles while delivering on promises for change would be a challenge for Mr. Ford under normal circumstances – but Ontarians aren’t sure how he’s going to do it. Video analysis: Doug Ford campaigned well, Adam Radwanski argues, but the challenges for the incoming premier will come quickly. John Ibbitson: Does Doug Ford’s victory signal the end of common sense in Ontario politics?